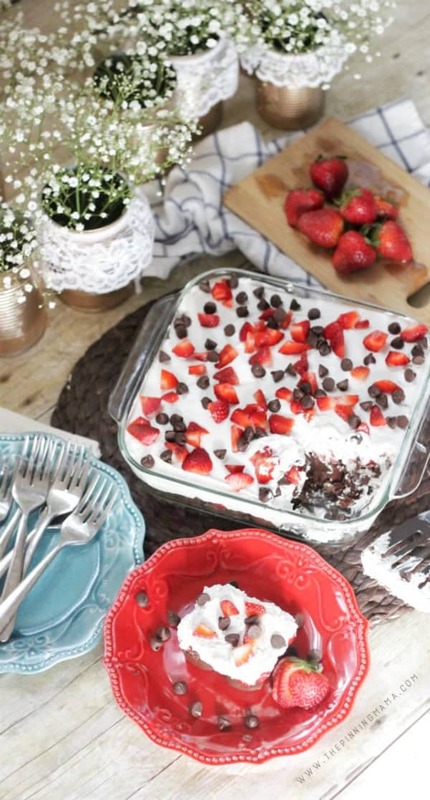 The perfect easy to make no bake dessert for special occasions or pot luck dinners! 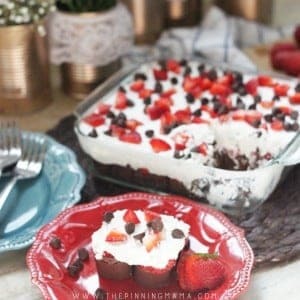 This Strawberries & Cream Chocolate Cake takes minutes to put together and combines some of our favorite flavors, chocolate and strawberry! I was excited to partner with Little Debbie to bring you this recipe. All the fun, crazy, and romantic memories from growing up and opinions in this post are my own. Chocolate + Strawberries = True love. Or something like that… It is definitely one of my favorite flavor combinations. As a matter of fact on the first big date my husband took me on, back when we were just babies in college, he knew I absolutely loved chocolate and strawberry, so he made chocolate covered strawberries for me FROM SCRATCH! He dipped them himself. Can you imagine an awkward college boy who barely knew how to use the microwave doing this?! Seriously… How sweet is that!? That might have been the first and last time he has ever cooked for me, but fast forward a couple (or many) years and 3 kids and we both still love chocolate and strawberries. Now, though, quick and easy is just as important as delicious with busy family life. 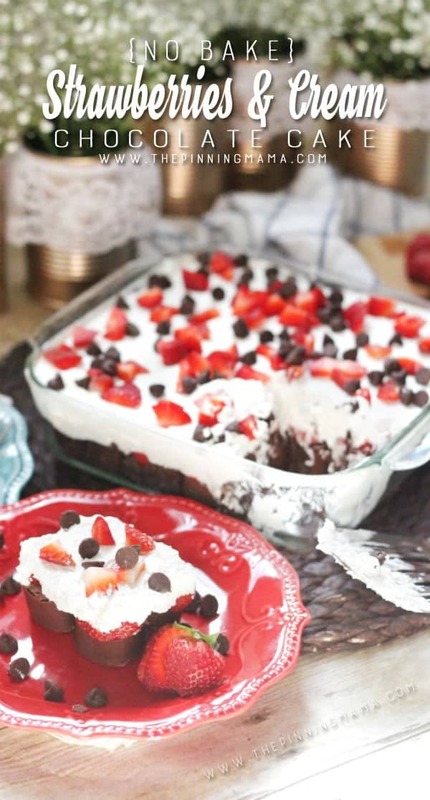 In my Strawberries & Cream Chocolate Cake, it is all of that, plus no bake which makes it perfect for little 3 year old hands to help put together. 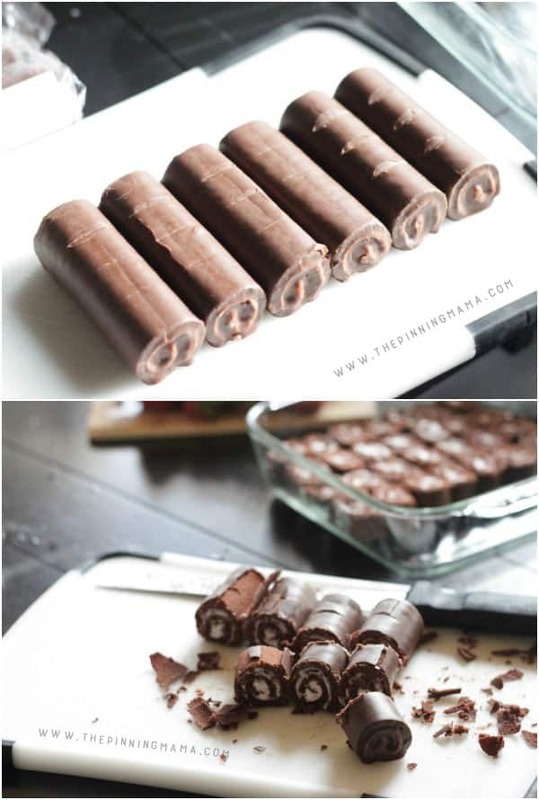 To make it no bake, it starts out with Little Debbie® Swiss Rolls which are layers of delicious chocolate cake rolled with sweet cream filling then covered in chocolate. Little Debbie® always brings back memories! I have years of memories of going to the store with my dad when I was little. We would walk up and down the aisles and feel the soft bread. If we were good though, we always got to pick a treat. My favorite then was the Little Debbie® Nutty Bars. I always without hesitation chose those! My dad loved the chocolate cake with the cream filling though and I used to try to steal the icing off the top! Here I am 30 years later still looking forward to my favorite treats! I guess it really is the taste you will never outgrow! To begin cut each of the Little Debbie®Swiss Rolls into quarters, which will roughly be one inch sections. Arrange the pieces into an 8×8 glass dish. You should be able to fit about 7 pieces in each direction. Tip: Line up several rolls evenly and use a large serrated knife to mark half, then quarters on the rolls. Then use the knife to cut on the marks on each roll. This helps get them very even for layering into the pan. Once the Little Debbie® Swiss Rolls are covering the bottom of the pan, wash and slice the strawberries and then layer them over the cake. Then spread the whipped topping over the strawberries to cover the dish and smooth it out with a spatula. 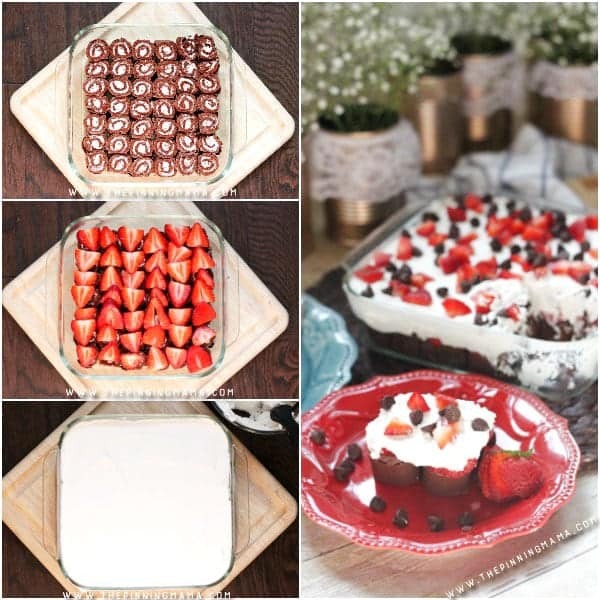 Finish up by sprinkling the remaining strawberries and a handful of chocolate chips over the top to garnish. You can pop it in the refrigerator until you are ready to go then just use a spatula to serve it up and enjoy! Let your kids help you make it, or even have the older ones make it for you! It will put smiles on faces at any occasion from a family dinner to a barbecue with friends! Now that you know about my stories, I challenge you to share your favorite Little Debbie® memories by tagging #SweetMemoriesGiveaway social media giveaway on Instagram for the chance to win $1,000! I can’t wait to hear your stories! Cut each Little Debbie® Swiss Roll into quarters. Each piece will be about 1 inch. Then place the pieces in the bottom of an 8x8 inch dish until the bottom is covered. It will be about 7 pieces by 7 pieces to cover it. Then layer 3/4 of that strawberry slices over the cake evenly. Spread the whipped topping over the entire dish and smooth out the top. Last, layer the chocolate chips and remaining strawberries on the top to garnish. This is genius!! And I know that it tastes amazing!! Pinned and sharing — I love this idea for a summer potluck! Thanks so much Blair! Isn’t it great to find things you can throw together quickly without heating up the house? This was delicious & easy. Only prob I had was that when serving it fell apart. I think I had to really get the whipped cream into the cake layers to make it stick. So I substituted the strawberries with strawberry pie filling. Also made one with Twinkies instead of Swiss rolls. HUGE hit!! !